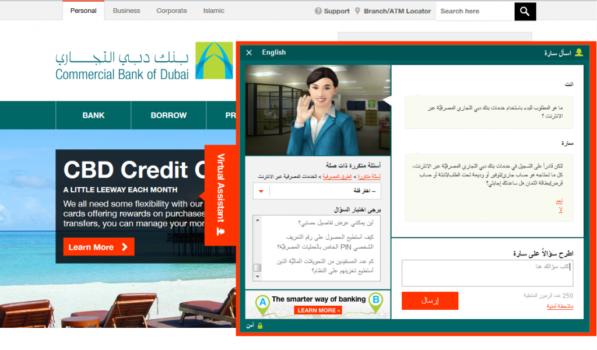 It’s been very exciting times recently as we prepared the launch of an Arabic version of Commercial Bank of Dubai’s (CBD) Virtual Assistant Sara. Building a virtual assistant in Arabic turned the interface and our natural language processing upside down. Or, to be precise, it flipped it from left-to-right to right-to-left. Once again, we saw the advantages of our rule based approach: Starting from the English version of Sara, we created a language library and a CBD knowledgebase in parallel. Doing this, we focused on the content needed for the project at hand, without having to start with complicated language models, grammars and whatnot. A quite straightforward process managed by the Netherlands and UK offices, in collaboration with the client who provided the business content while we looked at the natural language processing side of things. As V-Engine™ is language agnostic anyway, most of the work happened in V-Portal™ and soon we were having the first conversations in Arabic. My Arabic is non-existent unfortunately, so my own “dialogues” consisted of copying a question into the input field and enjoying the beauty of Arabic lettering. Proper tests were carried out by Arabic speakers at Creative Virtual and by CBD. We learned a great deal about handling Arabic and similar languages and, as can be expected, had a few unforeseen obstacles to overcome. The nice part of the learning exercise was, in fact, how smoothly various people can work largely independently on business content, language processing rules, knowledgebase structure and scripting, with only the first two tasks requiring any skills in Arabic! A successful approach that has since then been applied to the creation of other language cores. Soon we had dealt with all the issues, localized the UI, added Sara to the English site at cbd.ae and created a little language detection in both versions of Sara which make her offer a switch to the respective other language. You can also easily switch languages through a link in the UI. And now, conversation logs in Arabic are rolling in. Seems like the times will be very exciting a bit longer! If you want to know more about Arabic Sara, check out our official announcement and read CBD’s Customer Success Story.